We have recently launched a new "all in one" website where you can find the information on our full product range of towel rails and heating products. 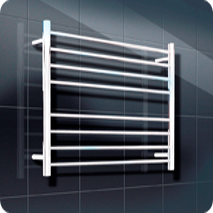 Radiant Heated Towel Rails are manufactured from premium quality 304 grade polished stainless steel and now come with a 5-YEAR replacement warranty. Our premium range of heated towel rails are available in a variety of sizes & styles, including round bar, square bar, non heated and floor to ceiling. You can see our heated towel rails on display and purchase them through a large number of high street retailers in all states of Australia. All of our heated towel rails have Australian approval & they come with a plug for 'soft wiring' AND a concealed wiring kit enabling them to be hard wired with no cable showing if required. We stock each model with cable on the left/right side and they can be inverted so that the cable exits from the top of the towel rail if required.